It was a classic day amongst a blur of adventure. The weather forecast left little to be expected. Grey was the outlook of the day, and a possibility of snow. I drove to Snowbasin under high grey clouds that appeared to be able to go either way. I was not optimistic. I hooked up with an old friend and touring partner, Wes Knopfel. I was on the gondola when he called me. I had a lap or two under my belt for the morning. The mountains had received about 4 inches of what we call, "Basin Butter". It is a thick dense snow that blankets the surface with a butter like consistency. 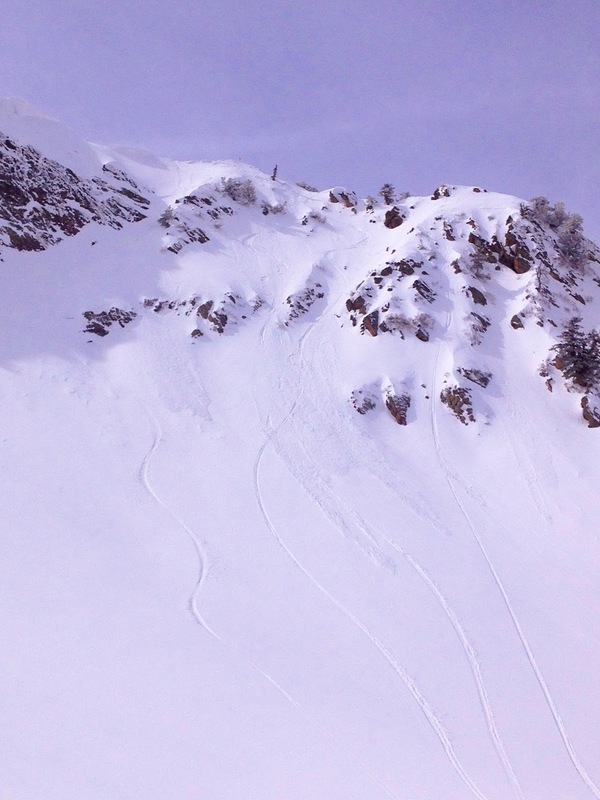 The key to skiing the butter is to find slopes that have smooth bed surfaces from before the storm. 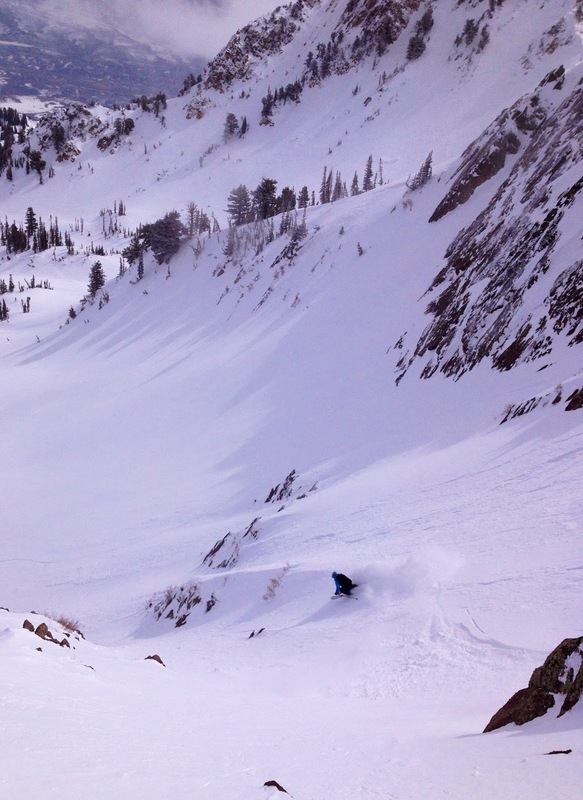 Luckily for us, Snowbasin is plentiful with big clean smooth slopes. The visibility was still low, but my hopes were lifting with the clouds. At about 10:30am the grey began to break. Wes and I were ready. We laughed as we rode up Strawberry gondola about the sunshine poking through with increasing momentum. The gift of bluebird skies was a welcomed surprise. ^We were not expecting to be on peaks, but we were not about to waste the opportunity either. Thankfully, we decided to ski prepared for the chance that backcountry terrain would avail itself to us. We were ready when the sun gave us the chance. We were happy to do so. 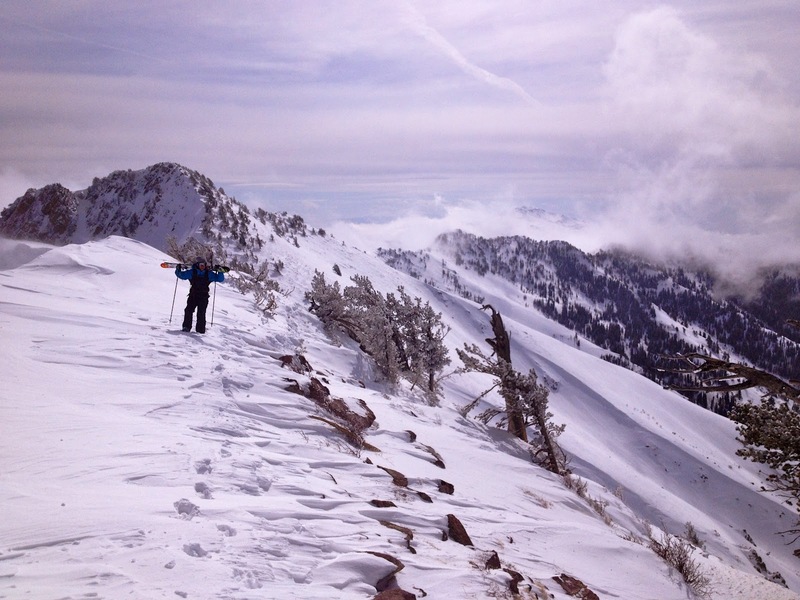 Above, Wes is all smiles as we traversed behind the cornice towards some of the most classic big mountain lines in the backyard of our beloved Snowbasin. ^Oh my goodness. We were a bit worried about windslab in the start zones of this peak face. 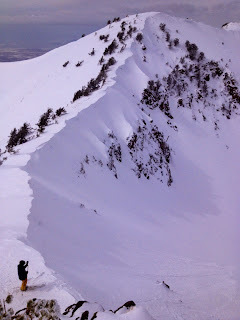 We did some cornice work on a typical start zone with promising results. "Basin Butter" can slab up some, but it also has a knack for sticking to the surface like a warm blanket in winter. 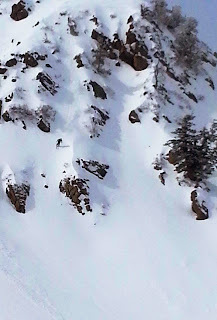 It is not the kind of snow you really want to huck cliffs into, but it is glorious for ripping fast and smooth big mountain lines. 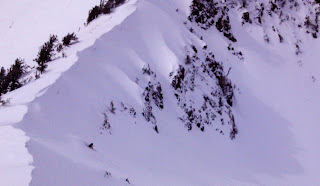 I had not had the chance to ski this particular chute on the face in a long time. 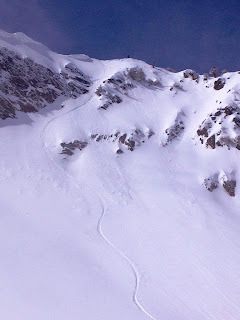 Usually when I am up here I am guiding in other athletes so I tend to take the more complex lines down ridge and put newcomers into this straight forward classic. However, today it was just me and Wes. No big cameras, other pros, radios, count downs, or expectations. Just me, Wes, the ridge, and the moment. Wes and I made our plans, and I looked at him with a million dollar smile and asked, "Eyes on?" He gave me the thumbs up, and I gave it back with a deep breath and a proclamation, "I am in." ^Smooth fast line, big white smile. ^Then it was Wes' turn. It was classic "Basin Butter" on some of her classic lines. 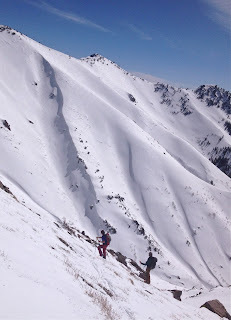 Wes and I were tossing high fives like teen-agers as we greeted each other in the base area of the shining peak face. Wes laughed as he explained to me, "I watched your two turns in through the start zone and I knew it was money in the bank!" 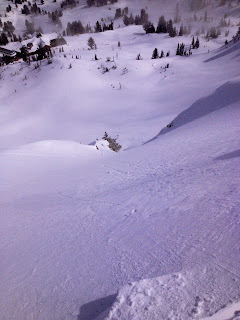 We exchanged a few more appreciations, snapped a few iPhone photos, and hurried back for another lap. ^We met up with our good friend, Paul Wright, on the ridge hike towards another lap. He was heading the same way as us. Paul was going for the next bowl to the north of Wes and I so we were able to have eyes on him when he dropped into his solo endeavor. ^Get some! 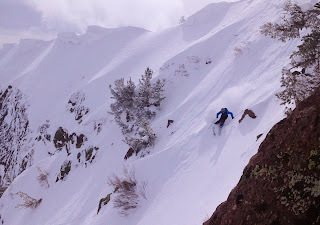 We were stoked to watch him layout his line. The butter is so smooth and fast. It is best to just lay back and ride it out that way. Paul is no stranger to the buttery phenomenon and he worked the clean untouched slope like a true artist. ^Wes and I tipped over the other side from Paul back into the face we had just come from. We had so much fun on the beautiful face on the last lap that we wanted to lay down some more of the classic lines it had to offer. I moved into position for one of my old favorites and then spotted Wes into his line. In the photo above he is slashing a small spine into the start zone of the line. ^Wes slashed his way through the start zone with speed as he makes his crux turn into the choke of the line. At this point he is all in. From there Wes has to point it through to the apron. Wes made the technicalities of the line look easy with his own smooth calculating style. That is when you know someone is a guru of their craft. 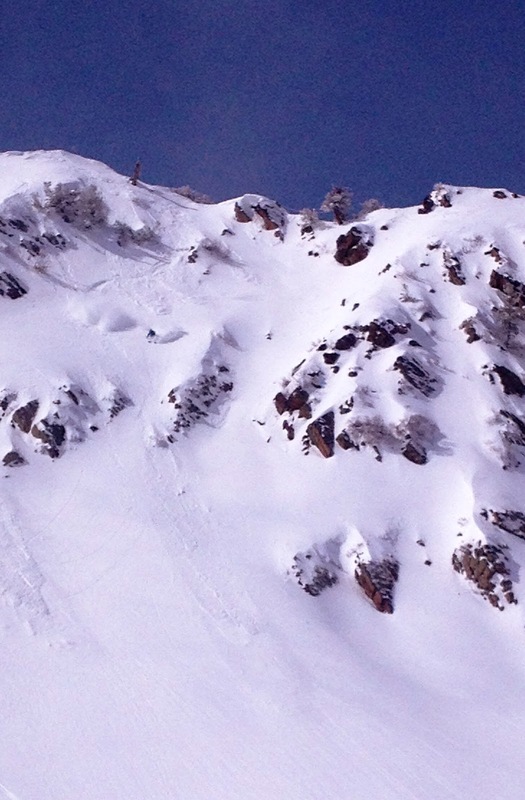 I am fortunate to ski in a class of rippers that consistently make difficult things look elementary. We've been operating in these kinds of terrain together for going on a decade now. My local crew and I have an unspoken language with each other. It is awesome to me how we operate on ridges and slopes together with a harmonious communication that only comes with a decade of doing so. Most of the time we don't even have to speak words. With a series of hand signals, a few "whoop" noises, and an arm wave we can speak an entire conversation that looks like a Tourette's syndrome attack to most people. ^Wes snapped this photo of me getting classic in one of my golden oldy favorite lines in the backyard backcountry of Snowbasin. I know this line well, and rock it like my childhood basketball hoop. However, it felt like the first time all over again. There is nothing like just letting it all out in the smooth truth of a fresh blanket of "Basin Butter". 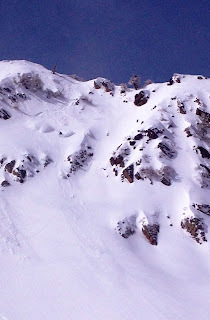 ^The chance to get up on this high alpine face was not expected when the day began. Sometimes you just need to be ready for anything. As I have come to learn in this crazy world, anything can happen. 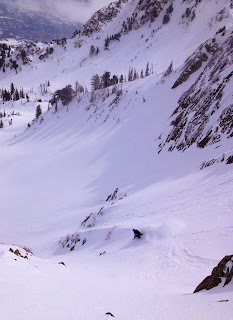 Wes and I were lucky and grateful for the surprise bluebirds and butter conditions. We jumped on the day like a sumo champion. I am super blessed for the gift of days like this with a trusted old friend to make it all the better. The older I get, the more I realize that few people have the opportunities I do to have such kinds of experiences. Wes and I had come through a decade together to bring us to that time and place with that kind of synergistic grace. Yet, doing so in a typically dangerous and scary situation to regular folks. For us though, we were in our natural element on a peak in the glow of sunshine basking the magnificent Northern Wasatch Mountains. Classic.